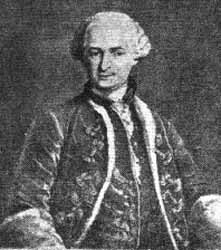 The Count of St. Germain, it turns out (purported death: February 27, 1784), was among other things a violinist, pianist, composer, inventor, traveler, courtier, adventurer, armchair scientist and alchemist, writer, wit, self-mythologizer, and brilliant conversationalist. He was, to say the least of it, sensational, pulpy, and known by some as Der Wundermann (The Wonderman). He is not nor was he ever regarded as a saint by the Catholic Church, and the St. before his name refers to his putative homeland. No one knows where the enigmatic Comte de Saint Germain came from, and no one knows for sure where he went. He vanished into time without any trace. Because of his genius and because of his mysterious provenance, he’s been embraced by occultists of virtually every stripe — most particularly those of a theosophic variety. Guy Ballard, founder of the “I AM” Activity (a theosophic school of occultism), claims that St. Germain dictated books to him. * The son of Francis II Rákóczi, the Prince of Transylvania. * The illegitimate son of Maria Anna of Pfalz-Neuburg, widow of Charles II of Spain. * The son of the King John V of Portugal. * And, most famously, from Dr. Raymond Bernard (The Great Secret – St. Germain), Sir Francis Bacon, true heir to the Throne of England, born to Queen Elizabeth I and Robert Dudley. The idea is that St. Germain was given to the Bacon family, who raised him and kept their secret under wraps. None of these theories, however, hold up to real scrutiny. The other day they seized an odd man, who goes by the name of Count St. Germain. He has been here these two years, and will not tell who he is, or whence, but professes [two wonderful things, the first] that he does not go by his right name; [and the second that he never had any dealings with any woman – nay, nor with any succedaneum (this was censored by Walpole’s editors until 1954)] He sings, plays on the violin wonderfully, composes, is mad, and not very sensible. He is called an Italian, a Spaniard, a Pole; a somebody that married a great fortune in Mexico, and ran away with her jewels to Constantinople; a priest, a fiddler, a vast nobleman. The Prince of Wales has had unsatiated curiosity about him, but in vain. However, nothing has been made out against him; he is released; and, what convinces me that he is not a gentleman, stays here, and talks of his being taken up for a spy (Letter to Sir Horace Mann, December 9, 1745, available on Project Gutenberg). The most enjoyable dinner I had was with Madame de Gergi, who came with the famous adventurer, known by the name of the Count de St. Germain. This individual, instead of eating, talked from the beginning of the meal to the end, and I followed his example in one respect as I did not eat, but listened to him with the greatest attention. It may safely be said that as a conversationalist he was unequalled. St. Germain gave himself out for a marvel and always aimed at exciting amazement, which he often succeeded in doing. He was scholar, linguist, musician, and chemist, good-looking, and a perfect ladies’ man. For awhile he gave them paints and cosmetics; he flattered them, not that he would make them young again (which he modestly confessed was beyond him) but that their beauty would be preserved by means of a wash which, he said, cost him a lot of money, but which he gave away freely. He had contrived to gain the favour of Madame de Pompadour, who had spoken about him to the king, for whom he had made a laboratory, in which the monarch – a martyr to boredom – tried to find a little pleasure or distraction, at all events, by making dyes. The king had given him a suite of rooms at Chambord, and a hundred thousand francs for the construction of a laboratory, and according to St. Germain the dyes discovered by the king would have a materially beneficial influence on the quality of French fabrics. This extraordinary man, intended by nature to be the king of impostors and quacks, would say in an easy, assured manner that he was three hundred years old, that he knew the secret of the Universal Medicine, that he possessed a mastery over nature, that he could melt diamonds, professing himself capable of forming, out of ten or twelve small diamonds, one large one of the finest water without any loss of weight. All this, he said, was a mere trifle to him. Notwithstanding his boastings, his bare-faced lies, and his manifold eccentricities, I cannot say I thought him offensive. In spite of my knowledge of what he was and in spite of my own feelings, I thought him an astonishing man as he was always astonishing me (The Project Gutenberg, The Memoires of Casanova, Complete, by Jacques Casanova de Seingalt). So obsessed have people become with the shadowy figure of St. Germain that in more recent times, a number of people have claimed to actually be him. Yet his life and death remain a delicious mystery.